Astronomers using the Atacama Large Millimeter/submillimeter Array, or ALMA telescope have made a groundbreaking discovery. According to a report from Phys.org, researchers from the University of Tokyo have spotted a nest of baby galaxies roughly 11.5 billion light-years from Earth. The discovery may offer new insight into the way galaxies form and interact with dark matter. Roughly 10 billion years ago, long before the time of the Earth and our solar system, massive galaxies were bustling with star-forming activity. Stars formed at hundreds to thousands of times the rate at which they do in the present-day Milky Way, and astronomers believe that all of the massive galaxies that used to create stars have since burned out. Scientists think that these baby galaxies eventually matured into massive elliptical ones, which populate much of the observable universe. Studies up to this point have predicted that these massive galaxies tend to form in areas that have a high concentration of dark matter. One of the biggest challenges to date has been accurately determining the position of these galaxies before any further studies can be done. Many of these giant star-forming galaxies are shrouded in dust, making them difficult to detect. The team, led by researchers Hideki Umehata, Yoichi Tamura, and Kotaro Kohno, used ALMA to scan a small section of the universe called SSA22, which was located in the constellation Aquarius. ALMA improved on previous research by allowing the researchers to view the section with 60 times stronger resolution than before, revealing nine massive galaxies in SSA22. By comparing the positions of the newly discovered galaxies to previous data, scientists discovered a massive three-dimensional web of dark matter that was otherwise invisible. The filamentary structure observed in the galaxy clusters, scientists believe, could provide the framework for the entire universe. 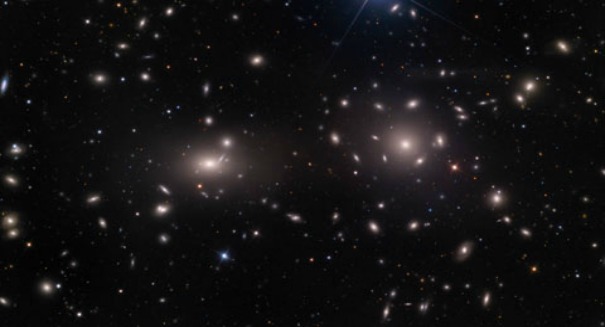 The baby galaxy clusters were typically found at the intersections of dark matter filaments. The study’s findings suggest that massive galaxies do in fact form where dark matter is abundant. This could provide new avenues of research into the older elliptical galaxies and the presence of dark matter at their perimeters. A press release from the University of Tokyo outlining the details of the study can be found here.